Bitdefender or Bullguard, which antivirus software is a better option in 2019? Read this comprehensive, data-driven Bitdefender versus Bullguard comparison to make a wise decision. These days, it’s imperative that you have solid antivirus protection installed on all your internet-capable devices, especially computers. After all, defending your computer against the onslaught of ever-evolving digital threats is now harder than ever. In 2018 alone, over 800 million new malware samples were released on the Internet. Ransomware attacks have also increased by over 97% in the past two years. Grabbing a reliable antivirus suite before your system is infected with malware is always a good idea. But any free or low-end antivirus won’t do the trick. We recommend investing in top-drawer security package, like Bitdefender Total Security 2019, for complete peace of mind. In this guide, will look an in-depth look at both Bitdefender and BullGuard to see which software is worth your money. In a rush? Take a look at our quick rundown for a summary of this detailed comparison. Winner: Bitdefender. Overall, Bitdefender offers more features and utilities in its security suites than BullGuard. Winner: Bitdefender. Independent tests confirm that Bitdefender is better than BullGuard in terms of malware protection. Winner: Both. It’s a tie in this category as both Bitdefender and BullGuard fared exceptionally well in the recent independent evaluations. Winner: Both. Bitdefender is better for specialists or anyone who wants to personalize their interface, while BullGuard is simpler and more basic. Winner: Bitdefender. Bitdefender offers more bang for your buck at every tier of antivirus coverage. Winner: Bitdefender. Independent estimates prove that Bitdefender is more popular than BullGuard. BullGuard offers an impressive line-up of antivirus products, but Bitdefender is clearly a better choice as it offers excellent malware protection with minimal impact on system performance. 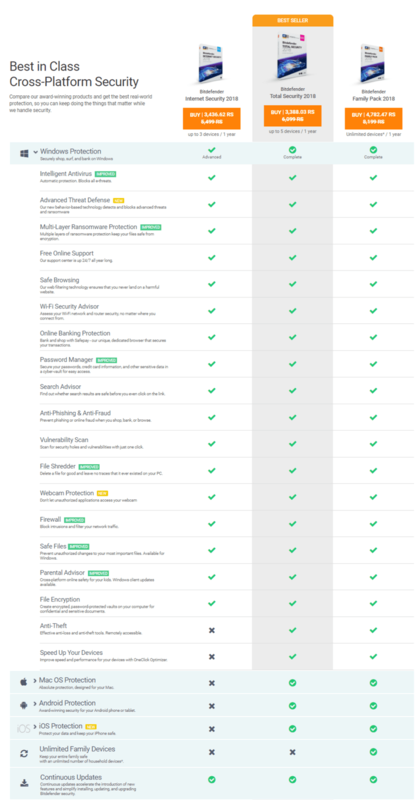 Also, Bitdefender offers better value for money than BullGuard. Now, let’s delve into the details. Let’s look at how Bitdefender and BullGuard compare in terms of features. First, let’s see what Bitdefender offers. Bitdefender Free Edition is the first antivirus product in the company‘s line-up. It’s only for Windows platform only and it’s freemium, which means you won’t find any advanced protection-related features or utilities. But it does protect against a range of malware threats, such as viruses, worms, Trojans, spyware. Next up is Bitdefender Antivirus Plus 2019, which is another Windows-only package. Besides providing excellent protection against all kinds of malware threats, it offers a password manager, a limited VPN for secure browsing, a file shredder utility to delete sensitive files, and an Anti-Fraud tool to defends against phishing/fraudulent sites. The Vulnerability Scanner module checks for outdated software and other security flaws in your operating system. The social media scanner detects malicious links and other malware that you may encounter on networking sites. Another level up is the more advanced package, called Bitdefender Internet Security 2019 (only works on PCs). This is a decent middle-of-the-road option that balances features with cost. It comes with everything that the “Plus” suite offers, along with a two-way firewall (monitors your network traffic and blocks attacks) and a webcam protector (protects your webcam from spies). The Safe Files utility (encrypts your more sensitive data to prevent unauthorized changes) and parental control features are also part of the suite. Bitdefender Total Security 2019 (compatible with Windows, Macs, and smartphones) is the company’s most popular security package. It comes with everything we previously mentioned but adds the Anti-Theft module; this will allow you to find any lost or stolen devices. The package also comes with several performance optimization features to improve the speed and performance of your system. A single license of the suite protects up to 5 devices (including Macs and smartphones). Out of all the high-end packages we have examined from top cyber-security brands, we have found Bitdefender Total Security 2019 to be the best in terms of value for money. 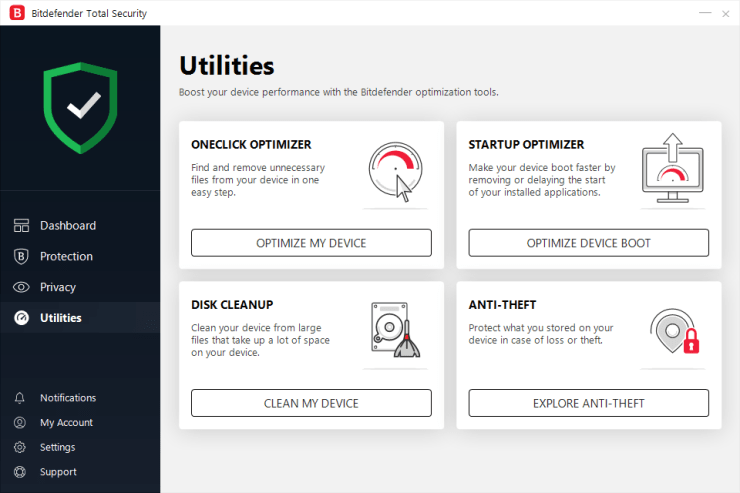 If you have more than 5 devices in your household and want them all protected with the top-notch security, we recommend Bitdefender Family Pack 2019. With a single subscription of this suite, you can install the “Total Security” on all your devices. For Mac-specific protection, Bitdefender offers Bitdefender Antivirus for Mac. It not only delivers excellent malware protection but also includes a bunch of useful utilities. Bitdefender also offers a host of business solutions. Check out this link to compare all the business products in detail. Now, let’s see what BullGuard offers. Like Bitdefender, BullGuard offers a range of antivirus products. The company’s first package is called BullGuard Antivirus. It contains a license for only one PC and provides you with a comprehensive malware scanner, along with anti-phishing and anti-ransomware shields. It has some other features too, like a behavioral engine that fine-tunes your antivirus experience based on your habits and what your computer can accomplish with its hardware. A safe browser included with your purchase can help you surf the web worry-free, and the Game Booster reorganizes your computer software and hardware priorities to make gaming better than ever. A single subscription protects 1 PC for a year. Next, we have BullGuard Internet Security, which is compatible with PCs, Macs, and Android. This suite comes with everything that’s part of the previous suite but adds an advanced firewall and a suite of parental controls, much like Bitdefender’s middling antivirus package. BullGuard Internet Security sweetens the deal with cloud-integrated backup and the PC Tune-up module. This package protects up to 3 devices with a single license. Another level is the most advanced package, called BullGuard Premium Protection. In addition to everything that’s included in the “Internet Security” suite, the package offers a smart network scanner (detect any threats on your local network) and identity protection. Interested in BullGuard business solutions? Follow this link for more information. Winner: Bitdefender. Overall, it’s clear that Bitdefender offers more protection-related features and utilities in its security suites than BullGuard. Malware is the most important aspect of any antivirus software. How can we find unbiased information that tells us which antivirus software is best in this regard? Well, we can use independent antivirus software testing laboratories who make it their mission to test different security products against one another to determine who’s truly the best. This will allow us to look at just the facts and ignore company bias which may not give us a clear picture. For our purposes, will use two different testing organizations. 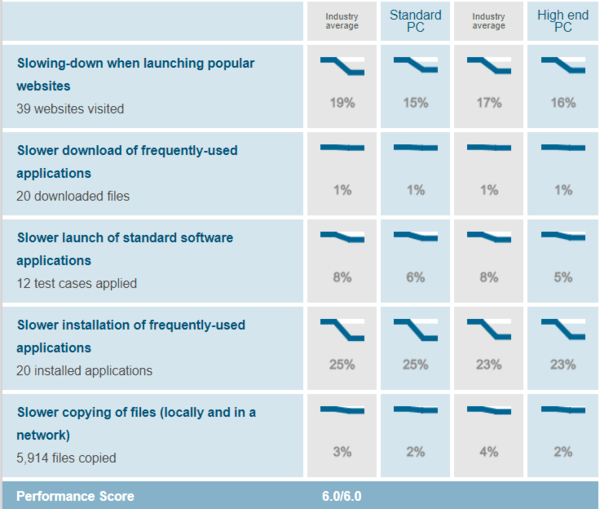 First, there’s AV-test.org which uses a rubric from 1 to 6 (with 6 being the highest score) to evaluate how well a security product defends against different types of malware infections. The company’s recent evaluations were conducted in November and December 2018. Next, let’s look at AV-Comparatives, another well-known independent laboratory in the antivirus space. Their Real-World Protection Test gives out awards based on the performance of a security product against thousands of malware samples. In the recent version of the test, Bitdefender was among the few products that received the highest ADVANCED+ award in the test, while BullGuard could only get the TESTED award because of its mediocre performance. Winner: Bitdefender. Overall, independent tests prove that Bitdefender is better that BullGuard in terms of malware protection. While malware protection capability of a security software is important, you can’t neglect how it affects your system performance. After all, if it slows your computer down too much, you won’t be able to enjoy your computer even if it is malware-free. Again, we’ll see the lab tests to find out which of the two software is better in this category. AV-Test’s most recent performance test was conducted in December 2018. 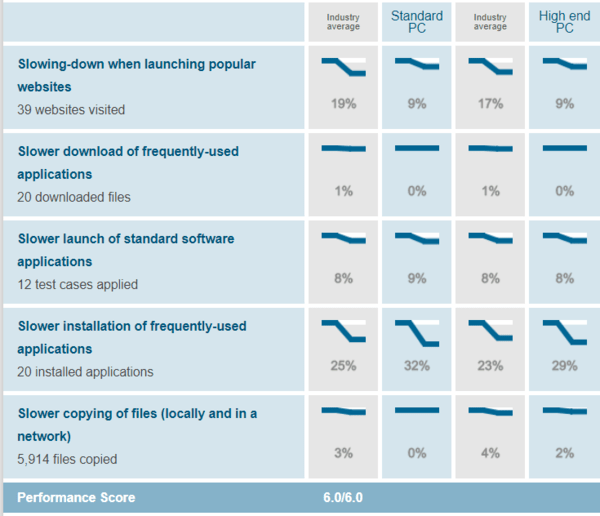 Bitdefender scored a perfect 6 out of 6 in the test. BullGuard also got full marks in this test. 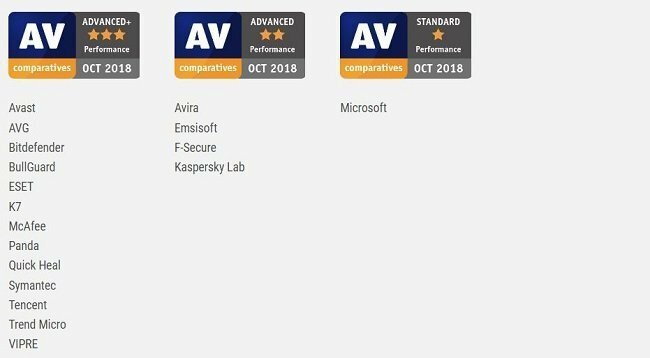 The expert at AV-Comparatives found that both Bitdefender and BullGuard were extremely efficient in using system resources; both software were awarded the highest ADVANCED+ award because of their low impact scores. Winner: Both. Both Bitdefender and BullGuard are exceptional in term of the impact on system performance. Now, let’s take a good look at how both software look. This can be an important consideration because it will directly affect both how much you enjoy using the software and how effective it will be in terms of doing what you ask of it. 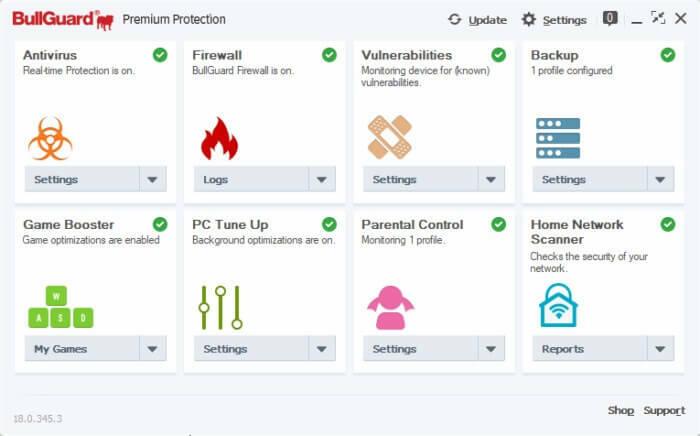 Bitdefender has a central theme of customization and personalization when it comes to its interface. It starts off intuitive and reasonably laid out, but you can program Quick Actions to act as personal shortcuts for specific scenarios. This can be very effective if you don’t want to have to remember all of the things on your antivirus to-do-list and would rather hit one button to accomplish everything. You can prioritize activities or make a complicated schedule depending on your preference. All of this user control will definitely appeal to you if you’re computer literate and like having the ultimate control over all your digital experiences. So if Bitdefender focuses on customization and specialization, how does BullGuard compare? BullGuard’s interface is sleek and elegant. There are different buttons and categories to do different things, and you’ll make use of pull-down menus and lists to examine the information the antivirus shows you. Utilizing its various tools, such as a home network scanner, is easy since most major functions take you to a totally different screen where you won’t be distracted or confused. However, switching the screens over and over might be frustrating for some folks. As opposed to Bitdefender, BullGuard’s interface tends to be very simple and straightforward, but there isn’t much room for personalization. Winner: Both. People have different preferences, so it’s a tie in this category. While all the above aspects are important to consider, pricing is equally important and may be the key decision for some readers. Bitdefender Free is, of course, as free as its name suggests. You don’t get much value from this package, but you do get a basic shield and a scanner. The company’s entry-level product, Bitdefender Antivirus Plus, costs $34.98 per year for 3 PCs. Next, you have Bitdefender Internet Security which costs $39.98 per year. Bitdefender Total Security protects five devices (PCs, Macs, or smartphones) for $44.99 per year, although you can add up to five more. Finally, if you have a large family, Bitdefender Family Pack is a great choice. It will protect all your devices for $69.98 per year. Let’s take a look at how BullGuard compares in the pricing arena. 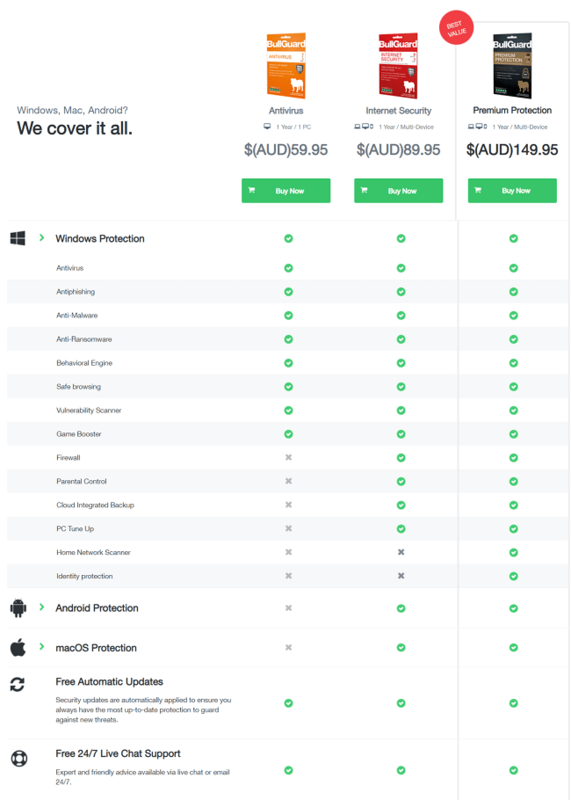 BullGuard Antivirus, the company’s cheapest coverage, cost $29.95 per year for one license. This is opposed to Bitdefender’s earliest paid to coverage, which covers three PCs. BullGuard Internet Security, for three licenses, costs $59.95 per year, which seems a touch expensive. BullGuard Premium Protection, for 10 devices, costs $99.95 per year. Winner: Bitdefender. Bitdefender wins this round, too, as it provides better coverage to more computers for less money at every step on the ladder. Finally, let’s see which company is more popular among users. OPSWAT is a well-known security company that regularly reports on the market share held by leading anti-malware products. Their most recent report came out in November last year. As per the recent report, Avast is currently leading the market with an impressive 18.44% market share, followed by McAfee (12.58%) and Malwarebytes (12.23%). Bitdefender is fourth on the list 10.64% share, while BullGuard wasn‘t among the top ten security products. Winner: Bitdefender. Bitdefender is more popular than BullGuard. BullGuard is competitive, but Bitdefender is a better choice for most users due to its comprehensive feature-set, superior malware protection, low impact on system performance, and better pricing model.